A circular economy refers to a regenerative economic system whereby waste and process by-products are turned into new inputs for new products. The regeneration is achieved through material choice, long lasting design, maintenance, repair, reuse, remanufacturing and recycling. 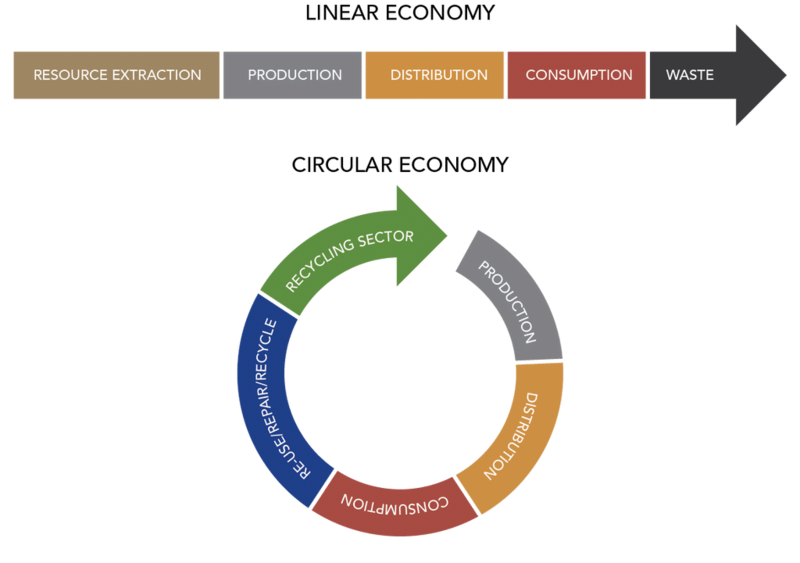 The circular economy perspective is in contrast to a linear economy view (see diagrams). A linear economy takes materials from the earth, makes something with them and then disposes of them. A linear economy seems to fit much of how we view products today. Oft times, the end-of-life disposal of products we all use tend to find their way to landfills in the US (or more typically incineration in Europe). The convenience of disposability combined with the low cost of many items tends to lead to linear thinking and systems. Domestic collection systems keep the linear economy disposable society hidden from public view. Where collection systems are not found in various locations throughout the world, the disposal of products and packaging tend to be found in the natural environment and in our waterways. Non-collected disposal is often referred to as leakage. Leakage is visible in our oceans and our lands. The goal of a circular economy is to eliminate leakage and all waste through closed loop systems. Closed loop systems seek to acquire the product at the end of its life, reprocess the collected materials in some way and then re-market the new products made to begin the cycle again. The waste from the 1st generation product forms the raw materials for the next product. If any of these steps are missed, we do not have a closed loop. If we cannot collect the items, if we cannot reprocess the items or if we cannot re-market the items, we do not have a closed loop system. Without closing the loop, used products become “linear” and wind up in landfills or in the natural environment as leakage. The concept of a circular economy has been around for decades. More recently in the last 5 years, it has been gaining increasing amounts of momentum through a wide variety of organizations, government mandates, consumer demand and media coverage. The momentum stems from the increasing awareness of how we as consumers have grown to view products as disposable. From appliances to clothing to packaging, the disposable / linear way of thinking has grown to dominate. For packaging, the Blue Planet TV program in 2018 and the cover of the June 2018 edition of National Geographic both showed the wide-scale problem of disposable packaging. Disposable plastics and packaging (bottles, cups, straws, bags, plastic eating utensils, plastic Qtips etc) have leaked into the natural environment at an increasingly alarming rate. How did it get there? Who is doing this? What can be done? Questions lead to more questions but all seem to bring us back to the concept of moving toward a more circular economy. There is a tremendous opportunity for converters like us to be a part of a movement toward more sustainable, more responsible and more “circular” way of looking at packaging. A circular economy for packaging incorporates systematic thinking on everything from design to raw materials we source to how we convert those raw materials to end of life thinking for the packaging we produce. In the months and years to come, Clear View Bag will be sourcing new materials (bioplastics, compostable materials, recycled content materials etc) to make into custom bags. We will be working internally to become a more environmentally sustainable manufacturer. We will be promoting the benefits of the sustainable materials we can offer. We will seek to “design with the end in mind” by offering materials that best fit known end of life scenarios. It is a long road but truly a road worth taking. Achieving an increasingly circular economy can only be done through coordinated efforts by governments, educators, trade organizations, innovators, entrepreneurs, businesses and the like. We are excited to begin this journey and look forward to sharing it with our customers, vendors and the entirety of this movement. This is the first of many blog posts related to this topic of sustainability. Listed below are two suggestions for those interested in learning more about the circular economy. The Ellen MacArthur Foundation (https://www.ellenmacarthurfoundation.org/) is a tremendous resource to begin to learn more about the circular economy. Delft University of Technology offers online courses about this topic. I recently completed “Circular Economy – an Introduction”. Excellent course and can be done at your own pace. More to come. Thanks. Be well.